Sounds like great days with your beloved ones! I love your coat and shoes, amazing! Your Christmas post never fails me somehow. I loveeee love it ! Merry Christmas, Anas ! Hope the joyful of Christmas be with you ! You're so lucky girl. You can spend your christmas with everyone you love. And I love your christmas outfit, simple. And chic! Anyway, did you cut your hair? I think that's shorter than before. That is such a beautiful red coat! Gorgeous pictures. Merry Christmas! Your red coat is extravagant! Wishing you a very merry Christmas too to you and your family! You look great on that outfit for Christmas! Merry Christmas to you . I like your red luxurious coat. All the best for next year. 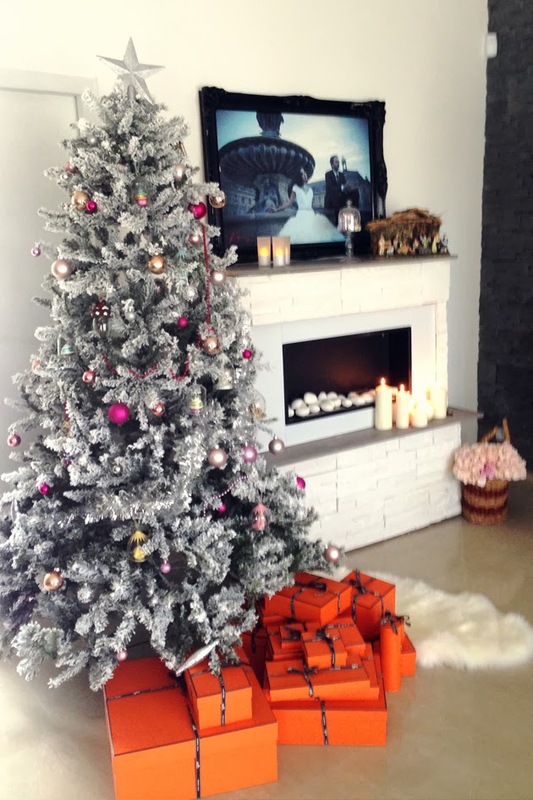 So many Hermes boxes under the tree! I'm sure your sister has an amazing home! I hope you had a great time yesterday! You looked lovely! Merry Christmas! Enjoy your Great Holiday! beautiful red coat and bunch of Hermes's boxes, I bet this is one of the best of your best Christmas..
Joyeux noel et bonne nouvelle annee..
those shoes is sooo pretty !! love the red coat ! Love all the photos here! !